The last time we visited pudding, it was in preparation for a liquid diet after having a couple of wisdom teeth yanked. I'm happy to say that this post has nothing to do with wisdom teeth, and in fact nothing to do with oral surgery. What I'm not so happy to report is that it does have something to do with surgery, at least in some tangential way. The Suitor, you see, is like a German Shepherd--or so his orthopedic surgeon tells him. As it turns out, he has hip dysplasia, and years of high-impact activities like running marathons have accelerated the inevitable deterioration of his hip. It was time for hip surgery. I'll spare you the gory details; suffice it to say that he avoided a full hip replacement, but he did need some work done. And work is what they did. The surgery went well, and the recovery is going well; but for the poor Suitor, surgery meant a return to the self-sufficiency of a toddler. If something was going to get done, I was going to be the one doing it--and that included everything from running errands to helping him in and out of his socks. Which, believe it or not, I have thoroughly enjoyed. For someone who doesn't have much interest in having kids, I sure do take to playing the mother hen. Unfortunately, as pleasant as caregiving has been for the psyche, it was not what the doctor ordered for the clot-ridden lungs. According to my hematologist, my recovery is progressing at the normal pace; but that pace is a lot slower than I had anticipated, and until recently I haven't been up for much cooking or baking. (My parents were incredibly helpful, bringing over dinners for us, running errands, and so on.) But my lack of cooking in general didn't keep me from wanting to make myself a little treat for the calm moments when the Suitor was knocked out by the Vicodin and I could curl up for a rest on the sofa. The trick, of course, was finding the right treat. Everyone has their favorite comfort foods, and specifically their favorite comfort desserts. I fall into two camps: when I'm feeling under pressure, sometimes the soothing familiarity of the creaming method brings me back down to earth, and I go for cookies or a cake of some sort. But when I feel like cozying up with a comforting dessert, I want pudding. And this time I wanted not chocolate pudding, but butterscotch pudding. I first tried what was billed as a tried-and-true butterscotch pudding recipe. Despite my having every confidence in the source, I wound up underwhelmed. The texture was lovely, but the butterscotch flavor didn't exactly come out swinging. That's fine if you're going for subtle (and as subtle flavor goes, it was quite nice), but I wasn't. I was going for knock-out flavor. 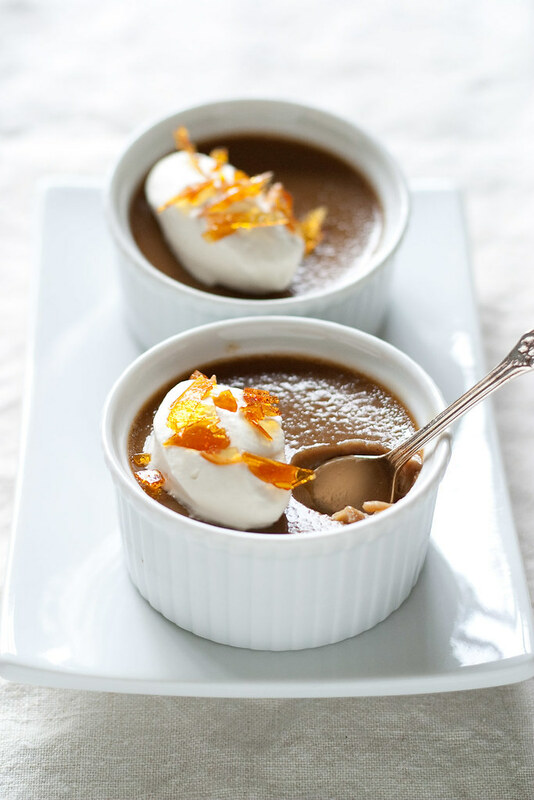 Fortunately one of my favorite food bloggers had recently posted a recipe not for butterscotch pudding per se, but for butterscotch pots de crème. A glance at the ingredient list--including two kinds of brown sugar, a slew of egg yolks, and some fleur de sel--convinced me that I was on the right track. and indeed, I was. 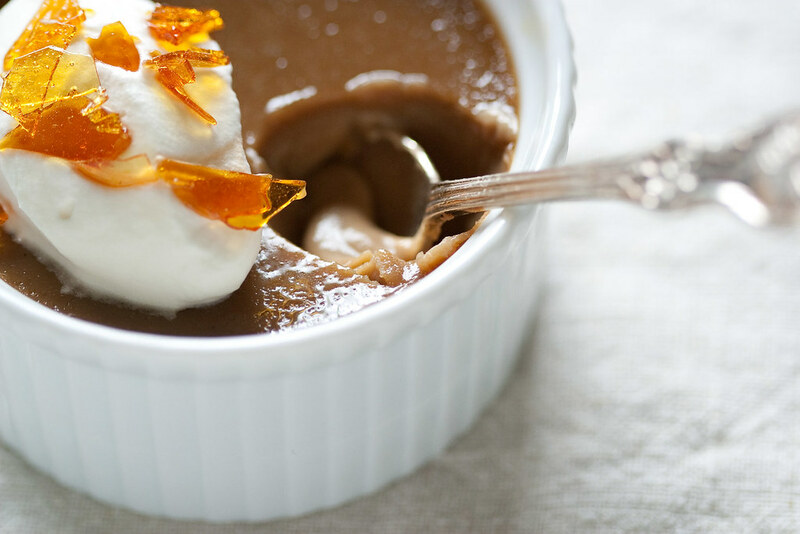 These little pots of butterscotch goodness are the very essence of comfort--at least for me. Your favorites might vary, but I suggest that you give this one a try. You just might find that you have a new favorite comfort food. Preheat the oven to 300F/150C. Get some water heating either on the stove or in the microwave. You'll need it for the hot water bath when the ramekins go in the oven. Combine the cream, milk, muscovado sugar, and salt in a small saucepan. 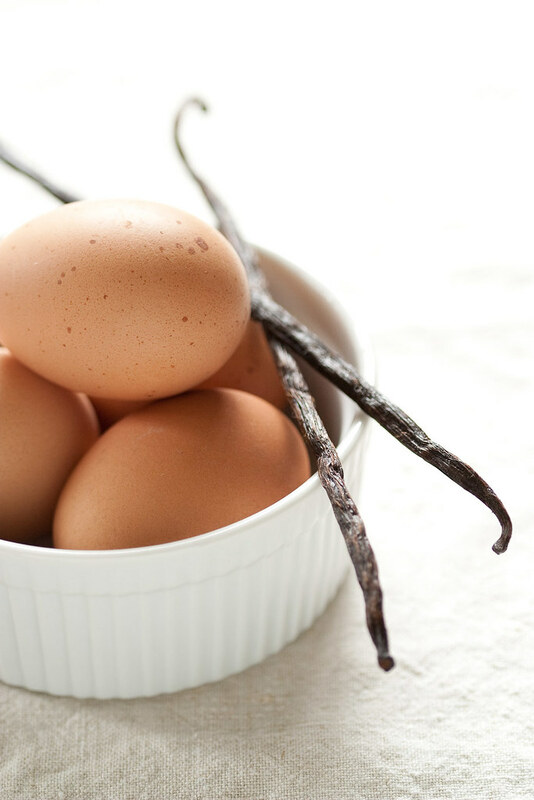 Split the vanilla bean, scrape the seeds into the pot, and add the scraped bean to the pot. Bring the mixture to a boil, then reduce (or turn off) the heat and keep the pot warm. Get out a medium saucepan, and place it over moderate heat. Sprinkle half of the demerara sugar evenly over the bottom of the pan. It will begin to melt at the edges, at which point sprinkle the remaining demerara sugar into the pan. Stir or swirl until the sugar is fully melted and a nice, golden caramel. Carefully (!) deglaze the caramel with the hot cream mixture, whisking in a little at a time. Keep whisking until you get all of the caramel to dissolve. If it's stubborn, return the pot to the heat and keep whisking. Those bits of caramel will work themselves out. Once it's smooth, take it off the heat if you like, but keep it hot. Whisk the egg yolks together in a medium bowl. Temper the yolks by adding a little of the hot caramel mixture, whisking well, then pour the tempered yolks back into the caramel pot. Strain the mixture through a fine sieve (or don't, if you're feeling confident or pressed for time), then portion it out into ramekins. Place the ramekins on a baking sheet, and pour the hot water into the pan and place carefully in the preheated oven. Bake until the pots de crème are just set in the center, about 30-45 minutes. Let cool to room temperature, then cover and chill before serving. If you can't find muscovado sugar, use the darkest brown sugar you can find. Similarly, if you can't find demerara sugar, use light brown or raw sugar. 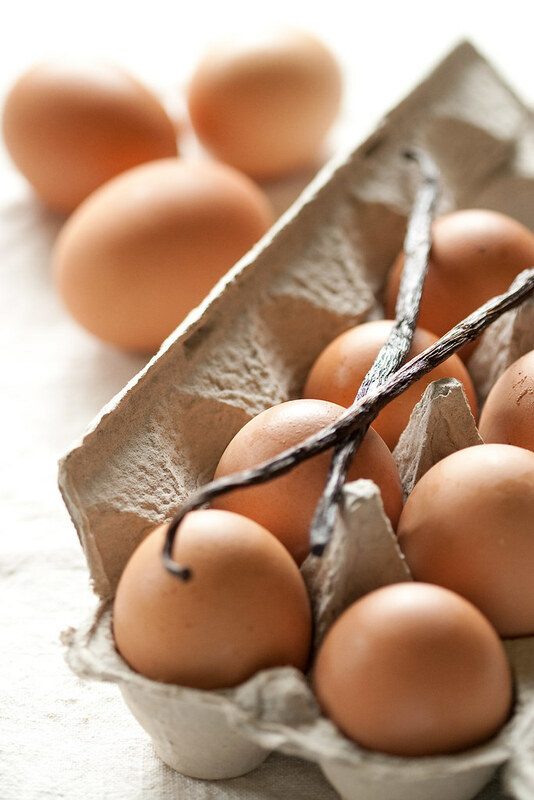 Need something to do with all those egg whites? Marshmallows are a good choice, and Swiss buttercream keeps beautifully in the freezer for all your impromptu cake-frosting needs. Is it awful for me to be thinking "lucky, lucky Suitor" when the man is laid up from hip surgery? This sounds divine, and the picture is gorgeous. Your photography just keeps getting better. I really do hope that you and the Suitor are on the road to health now. You're so sweet, Bee, thank you for stopping by. I think the Suitor is just grateful that he had someone around to help him with his slippers, fetching things, etc. when he couldn't do it himself. He's doing so well now, it's amazing how far he's come in just six weeks or so.